Five members of a family, including an eight-month-old baby, were poisoned by the servant who decamped with cash and jewellery worth lakhs of rupees in the Civil Lines area of north Delhi this morning. According to police, the incident came to light around 11.30 am from flat number B-11, Ganpati Apartments located at 6 Alipur Road. All three members of a family were found dead under mysterious circumstances at their house in Sector 9-A, here, last night. A consumer court has asked a Delhi doctor to pay compensation of Rs 3 lakh to the family of a seriously injured soldier who died outside his clinic two years ago and reminded him of the Hippocratic Oath he had taken to "render help to a dying man". 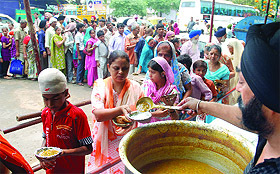 Devotees distribute langar at the Bangla Sahib Gurdwara on the occasion of Guru Harkishan Sahib Ji’s birth anniversary in New Delhi on Friday. Delhi Chief Minister, Sheila Dikshit has stated that there will be no deviation in deadlines fixed for completion of work, last date of digging and removal of 'malba' in respect of ongoing Commonwealth projects. Only the finishing work will be allowed to be undertaken during September. The Chief Minister said this at a weekly meeting to review the city's preparedness to host Commonwealth Games. Delhi urban development minister A. K. Walia today directed the agencies concerned to remove the disused telephone poles which gave a shoddy look to the areas around the Commonwealth Games projects. Walia was taking a round of the CWG projects in East Delhi. He visited Vikas Marg, Patparganj Road, Mother Dairy Road, Acharya Nagraj Road and Jagatpuri Road. He was accompanied by MCD deputy commissioner (South Shahdara) Rajendra Singh. The trial runs for the Central Secretariat-Lajpat Nagar section of the Badarpur Metro corridor commenced today at 10.30 am from the Lajpat Nagar station. The special cell of the Delhi police has arrested Nafees Ahmed (60), a resident of Lucknow (UP), and recovered incriminating documents used by him to help an alleged ISI agent in acquiring an Indian passport. He was arrested a few days ago from outside Patiala House after a tip-off. Delhi Technological University is going all-out to prevent ragging on campus. The university authorities have taken several measures to check this menace and ensure a safe environment for the first-year students when they join the new academic session on August 2. The Delhi police has arrested a criminal of western UP wanted in 15 cases of murder and an attempt to murder case in Bulandshahr. Now the students of those schools affiliated to the Uttar Pradesh Board of High School and Intermediate Education will be able to score more marks as the board has reduced the syllabus and adopted the Central Board of Secondary Education (CBSE) pattern for Class 9 to Class 12 from the 2010-11 academic session. The anti-corruption drive at the local tehsil office has nailed the second revenue officer within a week. Deputy commissioner Rajender Kataria has withdrawn the powers of registering documents from the Patoudi tehsildar after receiving complaints of corruption against him. With the arrest of two persons-- Mohd Yasin and Salim, the police has busted a gang that allegedly duped people by forging their credit cards. As dengue and influenza A (H1N1) have been on the rise, the city authorities and doctors have advised people to report such cases without delay. Going by the official data, the city has recorded as many as 19 and 31 positive cases of the vector and air-borne disease till early today. The actual number of positive cases, as reported from several private hospitals here, is more. Some unidentified men struck at the Central Bank of India branch in sector 22 in the wee hours today and broke its shutter but were unable to flee with the cash. After President Pratibha Patil's assent to the new Industrial Act for the national Capital-- the Delhi Industrial Development, Operation and Maintenance Act, 2010--, Delhi minister of industries Haroon Yusuf today announced that all industrial areas would now be maintained by the Delhi State Industrial and Infrastructure Corporation. Five members of a family, including an eight-month-old baby, were poisoned by the servant who decamped with cash and jewellery worth lakhs of rupees in the Civil Lines area of north Delhi this morning. According to police, the incident came to light around 11.30 am from flat number B-11, Ganpati Apartments located at 6 Alipur Road. The house is owned by a businessman Anil Maheshwari (55) who stays with his wife Urmila (52), son Manu (30), daughter-in-law Tanisha (28) and grandson Aarav (8 months). "The incident was reported when the maid came around 11 am and saw the house ransacked while the family members were in their bedrooms with foam oozing out of their mouths. She rushed to the president of the Resident Welfare Association, Yogesh Chandra Gupta and informed him of the condition in the house. Gupta took the family members to hospital and informed the police," said an official close to investigation. The family members were rushed to Sant Parmanand Hospital. Though out of danger, they are in ICU. According to Dr. Sagar Raja Gopal of Parmanand Hospital, they were poisoned, but the nature of the chemicals is yet to be determined. The police believes that the servant, Sambhu, hired only about ten days ago, is responsible for the incident. He has been absconding ever since. "The primary investigation reveals that the family was probably poisoned when served breakfast by Sambhu. Another servant who works in a nearby house and on whose recommendation, Sambhu was hired by Maheswari, is also missing. It seems the duo fled with the cash and jewellery in the house," said the police official. According to him, the bedrooms of both Anil Mahesawari and his son were thoroughly ransacked with safes and almirahs broken open with rods. "We cannot say anything about the losses yet as the family members are in hospital. However, Maheswari is a big businessman and the losses could be worth several lakhs of rupees," he said. The crime investigation team and forensic experts reached the spot and picked up samples and fingerprints. Police is also studying the CCTV footage obtained from the entry gates of the apartment. "Sambhu is from Bihar and we would trace him soon. We are working on some leads," said a senior police official from the district. According to information, Anil Maheswari owns a watch manufacturing unit in Gulabi Bagh and a showroom in Lajpat Nagar. All three members of a family were found dead under mysterious circumstances at their house in Sector 9-A, here, last night. According to the investigators, it seems that the head of the family first strangled his wife and son and then consumed poison to end his life. Dharampal Taneja, an employee with Maruti company, his wife Neetu and their 10-year-old son Arpit were found dead at their residence in Sector 9-A last night. Their neighbours, who went to the Tanejas' house in the night, got suspicious when nobody opened the door. The door was forcibly opened and all three members of the family were found lying dead in the house. The neighbours then called the police. "There were no signs of loot or physical assault in the house. So, we assumed that Dharampal had first strangled his wife and son and then consumed poison himself," said deputy commissioner of police Ved Prakash Godara. The post-mortem reports, which state that Neetu and Arpit had died due to asphyxiation/strangulation, while Dharampal's death was caused due to poison also tally with this theory. Godara said they were now trying to ascertain the circumstances which possibly led to all this. The Delhi State Consumer Redressal Commission in its recent ruling also asked the Medical Council of India to take appropriate action against Dr A.K. Minocha, who has a clinic in Janakpuri. The commission, headed by Justice Barkat Ali Zaidi, said in its scathing indictment: "Every doctor is bound by the Hippocratic Oath and must render help to a seriously injured person." Naik Subedar K.L. Gulyani had died outside Minocha's clinic two years ago after he was attacked by a gang of pickpockets while travelling in a bus. He got off the bus and tried to go home but collapsed right at the doorstep of the clinic. Minocha, a paediatrician, saw a bleeding Gulyani lying outside his clinic but went back inside to attend to his patient. It was a couple who had come to the clinic who finally tried to help Gulyani. They brought a stretcher from the nearby Orchid Hospital and carried him to the hospital where doctors declared him brought dead. Gulyani's wife Savita filed a case in the district forum against the Orchid Hospital, for failing to help the dying man, and Minocha. The district forum in 2008 awarded compensation of Rs 8 lakh to Gulyani's family-Rs 5 lakh to be paid by the hospital and Rs 3 lakh by the doctor. The hospital and the doctor filed an appeal in the state commission against the order. The hospital was absolved of the charges of medical negligence on the ground that when the patient was brought to the hospital he was already dead. But it upheld the commission's order against the doctor saying it was callous and cruel on his part not to help the injured Gulyani. Minocha argued that he was a private doctor and had no obligation to attend to any injured person lying outside his clinic. Two accused in the Sanjeeta Singh honour killing case last evening surrendered at a Noida court. R.N. Mishra, deputy superintendent of police. "We dug up a field in Bulandshar and recover the bone remains of Sanjeeta. After procuring court order, we will send the bones to forensic lab. This is enough to nail the killers," said Mishra. On February 15, Sanjeeta married Ravindra Kataria, a Dalit boy, at an Arya Samaj temple in Delhi. On April 30, her family members came to know about the marriage, after which they locked her up. However, on July 11, she managed to escape and reach Ravindra's house in Noida. But on July 18, her parents reached there and after promising to arrange a proper marriage ceremony for them, took her back home. On July 13, they allegedly strangulated Sanjeeta to death and burnt the body in the field and later ploughed the fields. The ashes and remains of her body got mixed in the soil. On July 18, Ravindera enacted his own kidnapping and murder which forced the Noida police to trace Sanjeeta. It was then that the police came to know about Sanjeeta's killing and arrested five members of the family on July 19 while they were trying to flee to Delhi from Noida. Delhi Chief Minister, Sheila Dikshit has stated that there will be no deviation in deadlines fixed for completion of work, last date of digging and removal of 'malba' in respect of ongoing Commonwealth projects. Only the finishing work will be allowed to be undertaken during September. The Chief Minister said this at a weekly meeting to review the city's preparedness to host Commonwealth Games. Dikshit instructed all agencies concerned to overcome the situation of lack of workers when she was apprised during the meeting that some agencies are finding it difficult to maintain their pace of work due to shortage of labour. It was reiterated that all accumulated malba will be removed by August 10. After that in case of any exigency, any agency is permitted to dig the road will have to restore it in earlier form immediately. She stated that main objective of organizing the meeting is to effectively ensure coordination between different agencies and overcome obstacles coming in the way of accomplishing the projects. A number of issues pending with Delhi police were resolved. 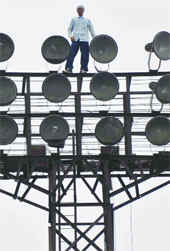 The police has agreed to permit execution of certain works during night time. It has also agreed to not come in the way of removal of malba by tractor trailers. The traffic police has submitted a comprehensive plan of pedestrian crossings. It is now for the MCD, NDMC and PWD to paint such crossings. The Chief Minister instructed the PWD to concentrate on roads close to Games Village and ensure proper streetlighting on these roads. She also gave certain instructions to overcome difficulties in providing various services in Karni Singh Shooting Range. The agencies such as DJB, PWD and MCD have been told to work in tandem. As regards NHAI it was reported that all important Badarpur Crossing will become signal-free with opening of both carriageways of the Badarpur flyover by September 30. The DMRC and NDMC have undertaken a joint inspection on those roads which are presently under DMRC in connection with their ongoing Metro projects. The DMRC has agreed to hand over all roads in the NDMC area by July 31 to enable it to finish works relating to footpath development. The NDMC has assured that restoration of Connaught Place will be completed by August 31. Delhi urban development minister A. K. Walia today directed the agencies concerned to remove the disused telephone poles which gave a shoddy look to the areas around the Commonwealth Games projects. Walia was taking a round of the CWG projects in East Delhi. He visited Vikas Marg, Patparganj Road, Mother Dairy Road, Acharya Nagraj Road and Jagatpuri Road. He was accompanied by MCD deputy commissioner (South Shahdara) Rajendra Singh. The BSES has also been instructed to remove extra material lying inside transformers. The old traffic light poles have also become an eyesore, Walia pointed out. There is rampant violation of the Defacement Act and the authorities are not taking any action. Walls pasted with posters, hanging banners and stickers need to be cleaned. The MCD has been asked to slap challans and register FIRs for violations. It has also been told to remove 'malba' near footpaths. Walia has instructed the MCD to deploy more personnel for the sweeping work. The runs will continue for a few weeks and they will gradually be extended up to Okhla and beyond as the works get completed on the other sections of the corridor. The corridor is expected to be opened for the public before Commonwealth Games 2010 after attaining the statutory safety clearances from the Commissioner of Metro Rail Safety (CMRS). The first trial run from Lajpat Nagar to Central Secretariat, covering the 9-km distance, was done today at a restricted and controlled speed since this was the first train running on this section. The 20.16-km Central Secretariat-Badarpur corridor is the second standard gauge corridor after the Inderlok-Mundka corridor. 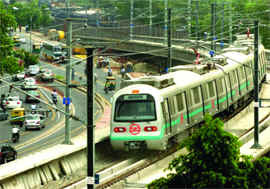 This entire line consists of 16 stations with Central Secretariat, Khan Market, Jawarharlal Nehru (JLN) Stadium, Jangpura Metro stations being the underground ones and Lajpat Nagar, Moolchand, Kailash Colony, Nehru Place, Kalkaji Mandir, Govindpuri, Okhla, Jasola, Sarita Vihar, Mohan Estate, Tughlakabad and Badarpur Metro stations being the elevated ones. During the trial runs, the interactions of the Metro train with physical infringements (civil structure) were checked to ensure that there was no physical blockage during the movement of the train on the track. The signalling system will also undergo rigorous testing. Subsequently, the response of the train at different speeds, braking of the train and the interconnection with the operations control centre (OCC) will also be monitored during the trials. The behaviour of the track system and the overhead electrification (OHE) will be checked repeatedly during all the trials. Ahmed managed to hoodwink the police for the past eight months. The police had even declared a reward of Rs 25,000 for his arrest. Ahmed was wanted after the arrest of one Sayed Aamir Ali by the airport police on November 9 last year. Ali, who had an Indian passport, was trying to flee to UAE. His interrogation revealed that his actual name was Abdul Jabbar, alias Saiyyed Aamir Ali, and that he was a resident of Mustfabad, Lahore, Pakistan. On his search, some sensitive documents pertaining to the Indian Air Force were recovered. "During the investigation of the case it came to light that Jabbar was a Pakistan national and had come to India on the directions of his mentors for espionage and subversive activities. He was given training in Pakistan. It was learnt that Jabbar managed to obtain an Indian passport with the help of Ahmed," said a senior police official, adding that forged documents like ration card, marksheets and school leaving certificate were arranged for Jabbar by Ahmed. Ahmed also allegedly provided shelter to Jabbar in Lucknow. The university has constituted a university-level committee comprising senior faculty members to make DTU a zero-tolerance zone for ragging. Besides the anti-ragging committee, there are squads to keep a vigil and conduct surprise checks in public areas as well as hostels located on campus both during the day and night. The hostel attendants will maintain a 24x7 watch and they are armed with mobile phones to immediately report any incident of ragging to the authorities. DTU has eight hostels for boys and three for girls, housing around 1,400 students. The university has also assigned one faculty member to a group of 15 first-year students, as a mentor to help and guide them in the hour of need. Surveillance cameras have been installed at the main gate and the entry of hostels. It has been also decided that no outsider, including ex-students, will be allowed to enter the campus after 10 pm. Furthermore, the university will be organizing a seminar on anti-ragging in the first week of August. Boards and banners on the anti-ragging policy and contact numbers of the members of anti-ragging committee have been widely displayed on campus. The Delhi police special cell arrested the accused Mange Ram, alias Harender, (35) near Gopal Dass building in CP where he had come to meet his associate to plot the murder of his opponent in Bahpur village, Bulandshar. It was learnt that Mange Ram had attacked and injured one of his opponents in the village on that day. Mange Ram entered criminal life while in school. He has a long-standing dispute with Budh Singh of his village. Both are from affluent families. Mange Ram was allegedly involved in murder of Budh Singh's father and his two brothers. As a result, Budh Singh allegedly murdered Mange Ram's cousin Ajay. Thereafter, Mange Ram formed his gang, which included Parwinder of Ladpur, Kuldeep, Bagwala, Krishan and Shokender. Mange Ram's wife Jyoti is the village pradhan. Mange Ram wanted to contest the forthcoming local body election. Therefore, he decided to fix Budh Singh so that he could not contest the election. "Under the UP Board in the past, students had to take two exams in each subject and three in maths. There were 12 papers. Now as per the CBSE pattern syllabus, students will have to take just one exam for one subject. Syllabus too has got reduced considerably," said Jyoti Prasad, district inspector of schools. Students are happy with the new pattern. "Now instead of 12 papers, we will have to take just five papers under the new pattern. We are feeling more relaxed now," said Kamla, a class 10 student. "Only changing syllabus on the CBSE pattern will not serve any purpose. The UP Board should provide other infrastructure and facilities too as per CBSE guidelines," said Rashid Ahmad, class 11 student. "The development will also reduce suicidal tendencies among the students," said Kanchan Chauhan, class 10 student. Some teachers feel the earlier syllabus was better. "English was the main concern in UP Board schools. Students have fear of English. In other subjects, they have no problem. Under the new pattern, the number of students passing the exam will increase, though they will have less knowledge," said R.N.Varun, chemistry teacher. High school and inter-college students at Greater Noida are also satisfied with the new syllabus. In this case, Satparkash of Nanukhurd village in Patoudi tehsil of the district had alleged that the local tehsildar, Satish Yadav, had refused to make an entry to his mutation and demanded a bribe of Rs 1,000 from him. The complainant also alleged that despite the ban on registering general power of attorney (GPA) outside blood relations, Yadav was registering such documents. He gave examples in support of his allegations, stating that six such illegal GPAs were registered by the Patoudi tehsildar from April 7 to 12, this year. A complaint was made to the Patoudi SDM, Vatsal Vashist, who sought an explanation from the tehsildar. However, the SDM did not receive a satisfactory reply from him. Following this, Vashist brought the matter was brought to the notice of the deputy commissioner and district revenue officer PD Sharma. Taking action on these complaints, Kataria withdrew the registration-related powers of Satish Yadav. Only a couple of days ago, the registration powers of naib tehsildar of Gurgaon, Kulwant Singh, were withdrawn by the deputy commissioner after he found irregularities in his functioning during an inspection. The arrests were made after the complaint of one Rajan Suri who had received a phone call regarding a sudden increase in his credit card limit. After sometime, he came to know that somebody had shopped of over Rs 54,000 using his credit card. After investigation, Yasin of MSK Enterprises was held. He disclosed that the transactions were made by Salim and his other accomplice Noman. The accused would lure customers over phone and promised them of increasing their credit card limit. Once the customers would agree and hand over their credit card to them, the accused would carry out fake shopping after pasting pieces of credit card and swapping through MSK Enterprises, said a senior police official. To ensure that the situation is under control, the Municipal Corporation of Delhi (MCD) has intensified its vector surveillance programme and the city health department started coordinating with the various government hospitals. Doctors maintain that the prevailing atmospheric conditions, especially the current levels of humidity, have provided a conducive environment for the mosquito to breed and if proper sanitation is not maintained, H1N1 infections could also increase. "In view of the CWG, the civic agency has intensified its surveillance drive against dengue," said the MCD medical officer, Dr N K Yadav. "The bank is located on the ground floor of the building, while tenants live on the first floor. The bank was closed when the burglars struck. In the morning, when the bank staff came, they found the shutter broken. However, things were intact inside the bank and the cash chamber was undisturbed," said V.C. Tripathi, deputy superintendent of police. After President Pratibha Patil's assent to the new Industrial Act for the national Capital-- the Delhi Industrial Development, Operation and Maintenance Act, 2010--, Delhi minister of industries Haroon Yusuf today announced that all industrial areas would now be maintained by the Delhi State Industrial and Infrastructure Corporation (DSIIDC). According to the new Industrial Act, the DSIIDC will be responsible for the development and maintenance of infrastructure of industrial estates that are being maintained by the Municipal Corporation of Delhi. The Act also empowers the DSIIDC to redevelop industrial clusters in non-confirming areas.